Your project structure was built with your main page named default.html. Change the name of this file to dist/index.html to match your Enyo application. , does not seem to work. Has any body had success with deploying to windows 10?. Using ver.2.7. "Your project structure was built with your main page named default.html. 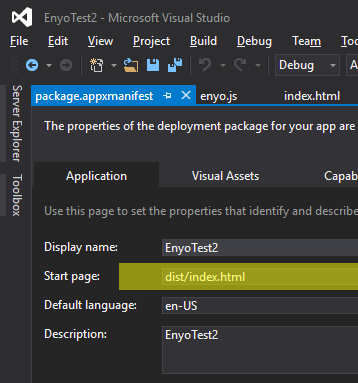 Change the name of this file to dist/index.html to match your Enyo application." You don't actually need to change/rename your default.html file. The guide should probably be updated to more clearly describe that you simply need to change the VS project's entry html page from default.html to enyo's default dist/index.html location. In fact, I just delete/remove the default.html file from my VS project altogether. That won't be a problem as long as you update your entry html page in your package.appxmanifest file. Thanks for clarifying. Deleting the default.html file and setting the index.html path to dist/index.html for Start page in package.appxmanifest works fine.